Born in Sweden, Michael Wicander lives in Franfurt/Main, Germany. Since the turn of the millennium, the passionate panoramic photographer is working intensively on the high-resolution Skyline Photography. In the meantime he has taken a significant amount of panorama photos not only in Frankfurt but also in other cities and places in the world from New York to Paris, London, Frankfurt, Dubai and Singapore - breathtaking, extremely detailed panoramas - partly with a view angle of 360 degrees. The shooting technology is quite time consuming, because the panoramas are made from up to 30 individual shots, which are assembled with great care and a lot of patience to a complete panorama. Since mid 2011 the individual photographs have a medium format resolution up to 80 megapixels and a raw image file size 400 megabytes; a complete skyline consists of a much larger, overwhelming amount of data. 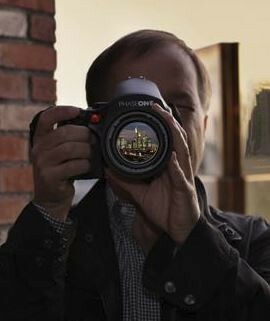 Michael Wicanders photographs have been exhibited several times, including on the "Night of Museums", or in different banks and law firms in Frankfurt/Main. The photos are sold in several well known galleries in Frankfurt. In 2012 Michael founded cameraflights for aerial photography and film together with his business partner Thomas Flüchter. Please contact Skyline Frankfurt for your individual project. Please contact cameraflights for your individual project. Panorama and aerial photography worldwide.